May 14, 1974 was the last day of my last year in art school. I was in the print shop. A friend asked me to clean the ink off a glass plate. As I placed a paper towel upon the ink, I had an impulse to play instead of wipe. I moved my fingertips upon the towel. As I lifted it, I saw organic imprints on the underside, created through the pressure of my touch. The movements of my fingertips had been recorded directly upon the paper without grasping a tool! I do not think I am the only person to have ever done this in a print shop…but something more was happening – a transmission of energy, and a vision of the potential of this process. At the time, all I could do was laugh, find more paper towels, and make more drawings. I laughed with the rush of energy roaring into me and out my fingertips. I laughed with the naturalness of play. I laughed with the joy of direct expression. After a while I began to bring pictorial form to these organic tracings, projecting the inner sensations of my face through my fingertips and onto the page. There was more going on than met the eye. It felt like a soul force flowing into my body and onto the page. The imprint of the hand on the cave walls arose in my mind. 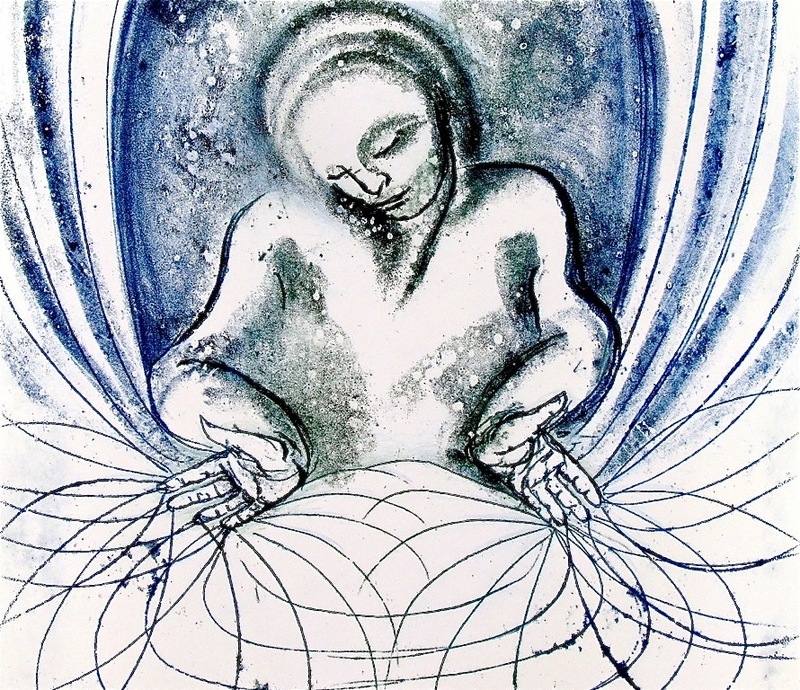 I sensed the archetypal power of the human hand directly expressing the internal nature of a human being. It felt like I was participating in another iteration of that primal human act. It felt like I was receiving a gift from outside of time – though I couldn’t conceptualize that there was any reality outside of time. A comprehension arose within me. I was tapping a source for human cultural evolution that we have tapped for emergent forms throughout our history. This creative process was making itself known at this moment for a purpose: to be a vehicle for expressing a consciousness that we were evolving towards; a consciousness that was more attuned to the fluid nature of the soul. Each drawing was an externalization of the sensations of the moment. In fully embodying this moment, a natural transformation was taking place that would be expressed in the next drawing. It was as if I was sculpting the subtle substance of my soul. I realized that this art form was unleashing a transformative human process. In those first moments, I also had a sense that this direct, body-centered from of drawing was emerging to counterbalance highly technological lives. This was 1974, and I had no idea of what would be emerging technologically in my lifetime. 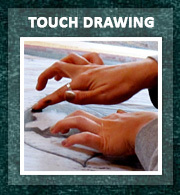 It has also dawned on me over the years, that Touch Drawing is a manifestation of the feminine principle. Rather than drawing with single-point stylus, we give birth to images directly from the body. 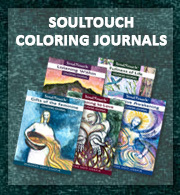 Touch Drawing is an integral process, naturally integrating the psychological, creative and spiritual dimensions of our being. Please explore the website to see the many ways this process is now being used. If you have done Touch Drawing, I would love to hear about your experience, and your vision of where we may go from here. Please write in the comment section below. Thanks so much for introducing this form in Tepoztlan, Morelos, Mexico, and also for providing this opportunity. I plan to integrate Touch Drawing with sacred geometry, especially in the creation of mandalas. Through meditation, images will emerge to be drawn reflecting personal soul energies. Not yet sure whether this will be entirely free hand, or may use round objects, like cups and plates to produce circles. I hope to find black paper to work with using brightly colored inks. help co create a world that works for all! Thanks Deborah for sharing your earliest images. Fascinating to see them and learn more about the story behind their creation. We will always treasure our Touch Drawing experience with you at our home in Tokyo! 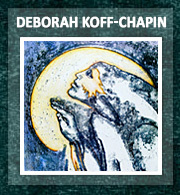 Wow, 40 years of sharing your expression and the gift of touch drawing with others Deborah!!! Did you ever imagine? Like everyone you have touched with this process, it is amazing and opens a new window to the soul. I am so grateful to have been given the opportunity to work with you in person, it took me deeper into the experience. May all the seeds you have scattered for this process continue to bloom! Imagine the next 40 years! Blessings! Wow….congratulations. What a beautiful story. I love the magic of touch drawing. Thanks for sharing. YOu continue to be inspiring. taking root at your feet. This precious gift that you have given the world has touched so many people, opened so many hearts, healed so many wounds, transformed so many lives. May all that has been given and spread out into the universe come back to you a thousand fold. Thank you for being you and for being the conduit of such a needed and graced process to help us in these times of consciousness shift. You are the Moses of the 21st century: your seeds have been planted throughout the world, healing past present and future generations, bringing us all to fertile soil where individually and collectively we blossom for the good of all. Sending you love and a depth of gratitude for what Touch Drawing has been in my life, and the transformation and healing I have witnessed in so many throughout the years. 40 years…it was the summer of 1975 when we did touch drawings together in your loft in Nyack. I can put myself back there in no time at all. I am thrilled for you with how it has grown into such a world wide process. May you continue to inspire and bring joy! Words can barely contain all the LOVE and continuous developments you have offered and how much I have personally enjoyed co-creating with you and Touch Drawing for the past 30 of these 40. Feeling so much gratitude for the ever blossoming revelations of beauty and healing to behold! From the comments so far, it appears that many of us are “hooked” and here to stay. Blessings for the next 30! As I think of such an extended period of 40-years,I am deeply moved – not only by your story and the mystical beauty of your drawings – but by your unwavering faithfulness to the Call of the Beloved you heard so long ago … and continue to answer year after year. This is where your “touch” has no boundaries, where your “touch” silently imprints a soul to trust and to be faithful to its own journey into the Unknown.This is the gift that “touched” me when I read your email this morning … and I bow as my heart/soul whispers its gratitude to you! Deborah, I am so grateful and blessed to be a part of the community and process that birthed through you that memorable day. Words pale to describe the depth, healing, beauty and joy that you and TD have brought to world and myself. The drawings say it all !!! Thank you for all that you do, continuing to hold TD so we all may experience it with you. I remember meeting you for the first time in 2007 at the IEATA conference in Boone, NC. 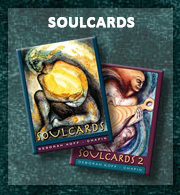 I noticed you first standing behind your table selling soul cards and telling people about the process. Who was this beautiful soul? Then I looked above you at your images hung upon the walls and I felt a deep connection, an ancient familiarity and knowing emerged within me. I bought a set of cards and headed back to Pennsylvania. It wasn’t until 2010 that I experienced the process first hands…7 years, two gatherings, and many magical experiences later here we are.